Cuba is the largest island in the Caribbean and supports 25 endemic species. With the exception of the almost-extinct Cuban Kite and the near-mythical Zapata Rail, this tour will target all of the other endemic species including Cuban Trogon, Fernandina’s Flicker, Bare-legged Owl and Zapata Sparrow and the world’s smallest bird, Bee Hummingbird. We will also enjoy the culture and heritage of this fascinating island. Day 1 After a morning flight from London to Havana, we will make the two-hour transfer to San Diego de los Baños, to the west of Havana, seeing our first Turkey Vultures overhead. If we have enough daylight, we will stop at a large reservoir where both Least and Pied-billed Grebes can be found together with Brown Pelicans, American Coots and wintering North American Ducks including Blue-winged Teal, Lesser Scaup and Ruddy Duck. Two nights in San Diego. Day 2 We start our Cuba birding experience in La Güira National Park. This superb area at the west end of the island is a highland region that is still well-forested. It is excellent for endemics and we should find a good selection of species to become familiar with such as Antillean Palm-swift, Common Ground-dove, Mourning Dove, Smooth-billed Ani, Red-legged Thrush, Loggerhead Kingbird, La Sagra’s Flycatcher, Cuban Bullfinch, Western Spindalis and Greater Antillean Grackle as well as some of the commoner endemics such as Cuban Green Woodpecker and Cuban Blackbird. We will visit the Cueva los Portales in the Sierra de la Güira where Che Guevara had his headquarters in caves during the Cuban missile crisis in 1962. Our most pressing targets here will be the endemic Cuban Solitaire, which despite its drab look has a beautiful yet haunting song. Louisiana Waterthrush can be found on the river whilst Scaly-naped Pigeons are quite common, there is a breeding colony of Cave Swallows in the caves and Cuban Martins can be seen hawking insects overhead. Nearby, we will look for the near-endemic Olive-capped Warbler, which is usually readily found in pine trees. This is also a reliable site for Gundlach’s Hawk as well as the endemic race of Red-tailed Hawk, and we will have our first opportunity to see Yellow-headed Warbler as well as probably our only opportunity to see Red-legged Honeycreeper. Farmland nearer to our hotel is the best place to see the highly-localised endemic Cuban Grassquit together with Yellow-faced Grassquit and wintering North American passerines including Indigo Buntings and Blue Grosbeaks. Our first full day is sure to be exciting. Day 3 We depart the western end of Cuba after breakfast for an all-day drive to the historic centre of Camagüey, the third-largest (and oldest) city in Cuba. It will be a long drive but we will make regular stops en route, including for lunch, and possibly see some new birds! Two nights in Camagüey. Day 4 An early start will be made for the Sierra de Najasa, south of Camagüey city. Before reaching El Belen reserve, we will pause at a regular site for the globally-endangered Plain Pigeon; both Cuban Crow and Cuban Palm Crow also occur here, facilitating an appreciation of the differences between these all-black species. Local Eastern Meadowlarks exhibit several differences from populations in the USA and could soon be described as a new Cuban endemic species! At La Belen itself we will concentrate on another globally-threatened bird, now endemic to Cuba, Giant Kingbird. Other species to be found in this area include the endemic Cuban Parakeet, the near endemic Tawny-shouldered Blackbird and many wintering North American warblers. After lunch at the ranch, we will check a nearby lake for Northern Jacana. Day 5 After breakfast, we’ll drive to the cays off the north coast of Cuba arriving on Cayo Coco via a 17-kilometre causeway in time for lunch. There will be time for an afternoon birding session to get to know our surroundings and we will visit a feeding site for Key West Quail-doves, where we hope to have outstanding views. This species has a rather limited distribution within the Greater Antilles and is probably easier to see here than anywhere else. Two nights on Cayo Coco on an all-inclusive basis. Day 6 Cayo Coco was once a wilderness known only to fisherman (including the most famous of them all, Ernest Hemingway). In recent years the Cuban government, using foreign aid (mainly Spanish, German and Canadian), has been developing the region for tourism, along the lines of the Jamaican model. Our pleasure at the ease with which we can now visit this region will be tempered by the fact that with the thawing of relations with the US, there will be a massive hotel building programme fuelling its destruction! In the migration seasons this is an exciting place to be, with a list of rarities to match anywhere in the Greater Antilles. As well as wintering North American warblers, there is a resident sub-species of Yellow Warbler (known as Golden Warbler and also found on the Florida Keys) which is a potential future split. Our full day in the area, however, will concentrate on finding the breeding specialities of the region. An endemic subspecies of Thick-billed Vireo is found nowhere else but here, Cuban Gnatcatcher and Oriente Warbler are close to the westernmost limits of their ranges and Mangrove Cuckoo and Bahama Mockingbird are, in Cuba, largely or wholly restricted to these islands. Clapper Rail is another feature of these keys and we may find a Sora whilst searching for one. In addition, a different subspecies (one of three) of the Zapata Sparrow is quite common on some of these cays. The beaches may harbour Piping Plover whilst small numbers of terns and gulls can be seen offshore and Magnificent Frigatebirds patrol overhead. The causeway is the best (and often the only) place in the West Indies to see Red-breasted Merganser but most visitors are, however, more impressed by the large flock of American Flamingos and the many waders and herons that use the area. A few other ducks can be found on the lagoons but the prize target will be the globally-threatened and range restricted West Indian Whistling-duck, which can be either found sleeping close to our hotel or at dusk when they fly into nearby sewerage lagoons to feed. The ‘Ridgeway’s’ race of Osprey is resident here and is regularly seen together with the endemic Cuban Black Hawk. Day 7 We leave Cayo Coco for the drive to Playa Girón, on the edge of the Zapata Peninsula, stopping for lunch en route and arriving in the afternoon. This is one of the richest areas for birds in the entire West Indies region. Not only is it the haunt of innumerable wintering North American warblers (American Redstart, Northern Parula, Northern Waterthrush, Ovenbird, Common Yellowthroat and Black-and-white, Black-throated Blue, Black-throated Green, Cape May, Magnolia, Palm, Prairie, Swainson’s, Worm-eating and Yellow-throated Warblers), many of which should still be present at the time of our visit. 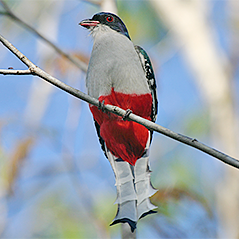 The area also holds more endemics than any other region of Cuba; over two hundred species have been recorded in the Zapata area. Four nights in Playa Girón on all all-inclusive basis. Days 8–10 Each day will follow a similar pattern: after an early breakfast we will head to an adjacent area (mostly patches of dry woodland) and bird until late morning before returning to the hotel for lunch and a short siesta, returning to the field mid-afternoon. Many of the areas we will explore hold similar birds and, for instance, we will search mixed flocks for the endemic Cuban Vireo, be ever alert for the short rattling call of a Cuban Tody (one of five species of tody, a family endemic to the Greater Antilles), enjoy views of the surprisingly common Cuban Trogon (the republic's national bird) and Great Lizard-cuckoo as they sit totally oblivious to us in full view! Some of our main targets will be the quail-doves, of which four species occur on the island and all can be found at several sites in the Zapata region. The gorgeous Blue-headed Quail-dove, which belongs to a monotypic genus, will be our chief quarry and is now quite easy to see at two feeding sites. The endemic Grey-fronted Quail-dove is more difficult to see as it doesn’t visit the feeders but our local guide knows where to find them! Ruddy Quail-dove is widespread throughout much of the Neotropics and we will probably bump into one during our quest for the other quail-doves although Zenaida Dove will doubtless provide occasional heart flutters, as this species is also frequent on Zapata's trails. Several woodpeckers are to be found in the region: Yellow-bellied Sapsucker is a common winter migrant (interestingly most are females; males appear to principally use Hispaniola at this season), while West Indian Woodpecker, the endemic (and possible future split) race of Northern Flicker and Cuban Green Woodpecker are all reasonably common residents. However, the ultimate prize is the rare and declining Fernandina's Flicker. This superb bird is known from several sites in this area, one of which also harbours a number of other hole-nesters that will be high on our wanted list, the near endemic Cuban Parrot and the endemic Bare-legged Owl. One morning we will take a packed breakfast and make an earlier-than-usual start to the famous Zapata Swamp. There are a variety of species along the track through the swamp and we should see the endemic Red-shouldered Blackbird. Our principal target however, will be the extremely localised Zapata Wren. This highly-tape-responsive species is often seen from the track and we will hope for good fortune. This locality is also home to Zapata Rail but the chances of seeing one are very remote whilst King and Spotted Rails also occur here but are almost as elusive! There will also be a range of common marsh birds including herons, Belted Kingfisher and Northern Harrier. Another species that is synonymous with Cuba is the smallest bird in the world, Bee Hummingbird. We will visit several of its known haunts during the course of our time in the Zapata region, two of which are also excellent areas in which to find quail-doves and wintering Nearctic migrants. We may also visit a local house where for a donation of a Peso or two we can watch (and photograph) several birds at close range together with Cuban Orioles and a selection of wintering migrants. American Kestrels are common in this area and we may see the endemic Cuban race with a much darker head. There is also the possibility of finding both Greater Antillean (Cuban) Nightjar (now widely regarded as distinct from the form in Hispaniola) and Stygian Owl at their daytime roost but if not, we will make a couple of early-evening excursions, one just a few kilometres from our hotel to look for the nightjar whilst the owl is a regular (but elusive) feature of the hotel grounds, being seen between the guest rooms and the dining area and swimming pool. Day 11 We will depart after breakfast for the three-hour journey back to Havana where we will have a short city tour followed by lunch and return to Havana airport for the overnight return flight to London. Day 12 Arrival in London at the end of the tour. General Information The climate can vary from warm to hot and although this is the dry season, rain is likely at some time. The tour pace is relaxed but with early starts. Walking is generally easy, mostly on level ground. There are some health requirements and you should consult your GP in this respect. Insects can be a minor problem in places and repellents are recommended. Visas are required. Group Size Minimum number for tour to go ahead: 6; maximum group size 12 with two leaders. Price includes economy scheduled return flights between London and Havana, visas, all transport within Cuba, accommodation in twin-bedded rooms in medium-standard hotels/lodges, all food (except two lunches) and most drinks, entrance fees to all parks and guiding services throughout. Excluded are alcoholic drinks (except for six nights in all-inclusive resorts), insurance, gratuities and items of a purely personal nature.